Alexander ascended the throne when his father was assassinated in 336 BC, almost immediately he began planning his war with the Achaemenid Empire of Persia, which was at that time the sole super power of the world, controlling a vast empire stretching from the borders of Greece, to Bactria (Modern Afghanistan). Alexander set off in 334 BC, as his ship was approaching the coast of Anatolia, he threw his spear onto the shore, claiming all Asia as his by right. 5 years later, Alexander had swept through the Near East, Egypt and Babylon and sacked the Persian capital Persepolis, defeating every army that stood in his way. But Alexander was still not satisfied, he persuaded his men that in order to permanently subdue the Persians, every last vestige of resistance must be squashed in the farthest corners of the Persian Empire, this meant that Alexander’s army would have to continue east, into Central Asia. Thus Alexander’s army continued on, conquering as far north as Uzbekistan and as far east as the Indus River Valley. At this point, Alexander’s army had begun to loose morale, they were tired and began to worry that they would never see their families back in Greece ever again. Furthermore Alexander began styling himself as an Oriental Despot: he dressed in Persian robes and insisted that his men kiss his hand when greeting him: all the symbolism of eastern tyranny that the army had supposedly come to defeat. Whilst Alexander was campaigning in India, he was wounded at the siege of Multan, thus ended Alexander’s campaign, he returned to Babylon in poor health, and 2 years later he died of unknown causes. 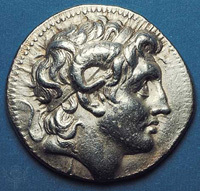 Coin of Alexander the Great with horns protruding from the head. 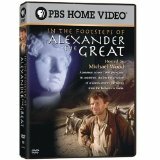 Alexander the Great is remembered as perhaps the greatest general in history. He had conquered the mighty Persian Empire at the age of just 25. In fact, Alexander is undisputedly the only European to have ever conquered Persia. He is also arguably the only European to have ever established a lasting regime in the region of Afghanistan: the Greco-Bactrian Kingdom, which lasted 300 years beyond his lifetime. Alexander was not just a conqueror, he was also a builder of cities, he founded more than twenty cities, most of them were given the auspicious name of ‘Alexandria’, and many are still thriving cities today. Alexandria in Egypt is the most famous, but there is also Alexandria in Ariana (modern Herat in Afghanistan), Alexandria Eschate, meaning ‘Alexandria the Farthermost’ (modern Khujand in Tajikistan), Ishkanderiya (Arabic for Alexandria) in Iraq, and Alexandria Ad Arachosium in Afghanistan (now called Kandahar, a contraction of Iskandahar). Think you know all about Alexander the Great? Test yourself on our quick online quiz.